File Photo: John Moore/Getty Images16 Sep 201827Illegal aliens allegedly assaulted two U.S. Border Patrol agents along the bank of the Rio Grande River border with Mexico. Rio Grande Valley Sector agents assigned to the Fort Brown Station encountered a group of about 30 illegal aliens who crossed the border from Mexico on Thursday. Some of the migrants jumped back into the river and swam back to Mexico while the agents apprehended about 19 of their fellow travelers, according to information provided to Breitbart Texas by Rio Grande Valley Sector Border Patrol officials. While the agents attempted to control the group of 19 migrants, others began to throw rocks from the Mexican side of the river. One of the rocks struck an agent on the shoulder, officials stated. While this was going on, a Guatemalan national began fighting with one of the other agents. After getting all 19 illegal aliens under control, the agents transported them to the Fort Brown Station for processing and biometric background investigations. The migrants will be processed for immigration violations according to Rio Grande Valley Sector guidelines, officials stated. U.S. Customs and Border Protection officials continue to refuse to release information about how many Border Patrol agents have been assaulted this fiscal year. Despite numerous requests for updated information, the latest figures available are through the end of May. Migrants assaulted a total of 464 Border Patrol agents between October 1, 2017, and May 31, 2018. Breitbart Texas reported extensively on many of the assault cases where Border Patrol agents became the targets of attacks. In one recent attack, a Border Patrol agent drew his service-issued firearm and shot him after a fight broke out during an arrest. The agent was not injured during the attack. The illegal alien sustained a gunshot wound to his arm. He was treated and released from the hospital. Do these agents have Tazers or any weapons for protection. This is outrages and OUT of control. We need to cut off ALL foreign aid we give to Mexico and turn these people right back around and dump them back over the border! Beezer, Judy and ALIPAC like this. 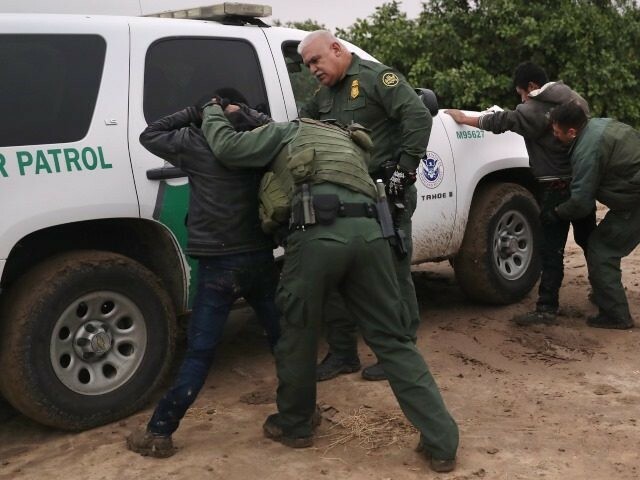 DOJ: Three Border Patrol Agents Assaulted Per Day + More!